Impacted machines can feature uneven lighting at the bottom of the screen, which looks a bit like a “stage light” effect, and the display can eventually fail entirely. According to repair site iFixit, which first highlighted the problem, 2016 and later MacBook Pro machines are using thin, fragile display flex cables that are prone to malfunctioning with repeated closing and opening of the MacBook Pro’s display. The flex cables are loosely wrapped around the display controller board and when the MacBook‘s display is opened, the cables are pulled tighter, leading to tears and problems over time. iFixit says the backlight cable is usually the one to break first, leading to backlighting issues and eventual display failure. The issue can impact any 13 or 15-inch MacBook Pro model manufactured in 2016, 2017, or 2018, though it appears to be affecting Touch Bar models more frequently. 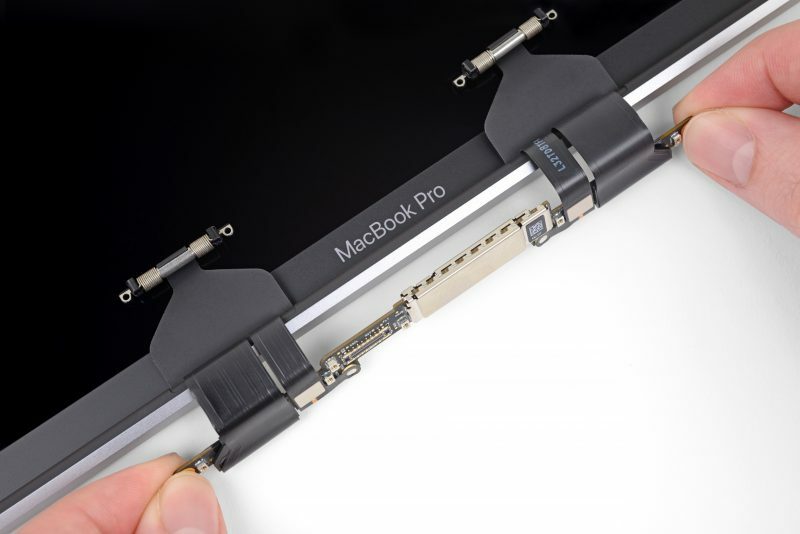 Apple introduced a redesigned MacBook Pro in 2016, and this was the first to use the new flex cable. Older MacBook Pro models are not impacted because they use a more durable wire that was routed through the hinge instead of around it, mitigating the stress of repeated display openings. The new MacBook Air models could also eventually be impacted. While they use a different display cable design, iFixit says the cables also wrap over the display board and could potentially exhibit the same failure. It’s not clear yet if that will happen, however. How long does it take for the problem to show up? When you first buy a MacBook Pro, the flex cable functions perfectly. With repeated closing and opening of the MacBook Pro’s lid, however, the durability can decline, leading to the display issues. Since it takes time for the cable to break down, machines experiencing this issue generally do not display it for several months to years after purchase. Because it takes time to show up, affected MacBook Pro models may no longer be under the one-year warranty. 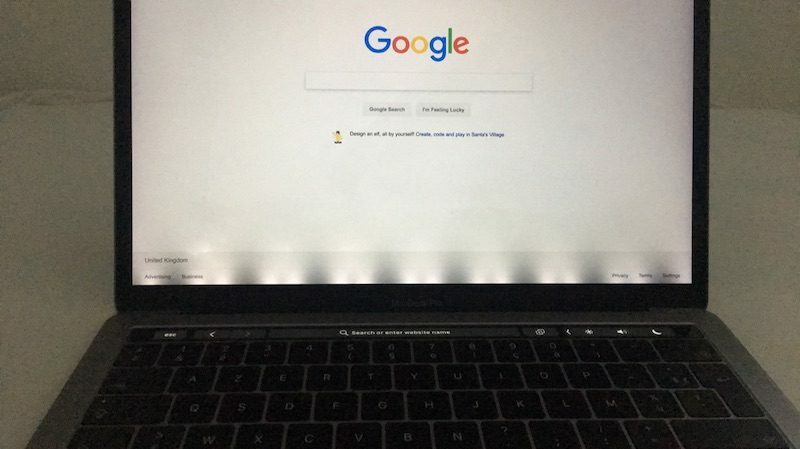 What do I do if my MacBook Pro has this issue? If your MacBook Pro has this display issue, the first step is visiting an Apple retail store or contacting Apple support. Unfortunately, when this problem surfaces, many MacBook Pro models are older than a year and no longer covered by the standard one-year warranty. Those who have an extended AppleCare+ warranty will be able to get their repairs covered by Apple. Customers who do not have AppleCare+ may be required to pay out of pocket for repairs. While it’s a simple cable that needs replacing, because of the way the MacBook Pro is designed, the flex cable is integrated into the display and requires the entire display assembly to be replaced. This can cost upwards of $600 for customers who are out of the warranty period. There have been reports of customers no longer under the one-year warranty that have been offered free or reduced cost repairs from Apple, but others have had to pay full price. Without a consistent policy in place, repair outcomes will vary. Just how many MacBook Pro models are experiencing this issue remains unknown, but a growing number of complaints have been surfacing over the course of the last few months. There have been complaints on the MacRumors forums and the Apple Support Communities. What does Apple have to say? Apple hasn’t commented on the issue at this point in time, and there is no repair program in place. Impacted users have started a website and a petition with the aim of getting Apple to offer free repairs via an extended warranty program. If you have a MacBook Pro experiencing this flexcable issue, check out the ongoing discussion on the MacRumors forums where are users are sharing their experiences with Apple support, replacement machines, repair costs, and more.